What do you do with an outdated-looking fireplace, that has crazy proportions, for around eighty bucks? I’ve had fun decorating for all the other seasons, too! Ours is a non-working fireplace, so if you’re thinking about doing this project on a working fireplace, you should check building regulations to see what’s allowed as far as adding wood and paint before you begin. Safety first! 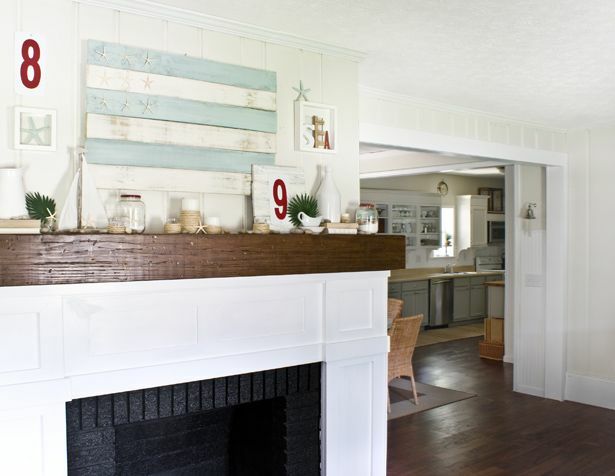 love that mantel! do you have the dimensions on it? i’d like to try your idea on a flat gas fireplace…do you think it would work? Love this transformation, is this a fully functioning fireplace, was everything fireproofed? 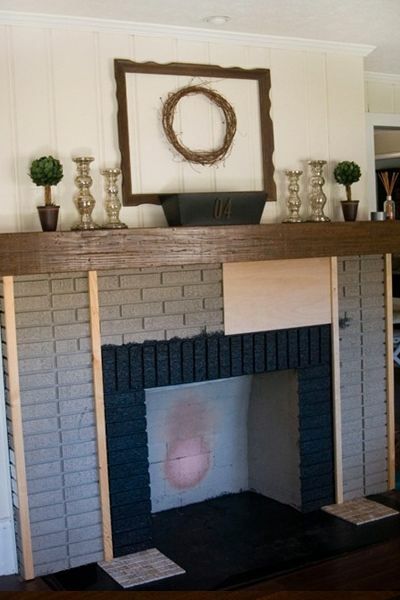 My friend has asked me to transform her fireplace and I love this idea, but I’m concerned about the wood around the fireplace for when she wants to use it. As far as we know it’s good to go Carli! We don’t burn wood in it though, but if we ever decide to have the gas line hooked up, we’ll definitely consult with a professional about it. I need to clean and paint the inside of our woodburning fireplace we don’t use and I was wondering what brand of heat resistant paint you used and where you got it. Also, what product would you recommend to use to clean it before painting? I love the look of this and would like to do something similar. Do you worry at all about the liquid nails not being strong enough to hold the weight of that wood up? Would you have done anything differently if your brick was already painted (would the liquid nails) adhere as well? The brick was actually already painted that taupe color and the luan and MDF we used are extremely light-weight, so the liquid nails has held everything up without a problem. I am a novice in every sense of the word! What is the type of lumber and stain that you used?? Merci! This was just what I needed to see! Thank you for your beautiful blog, you are an inspiration! 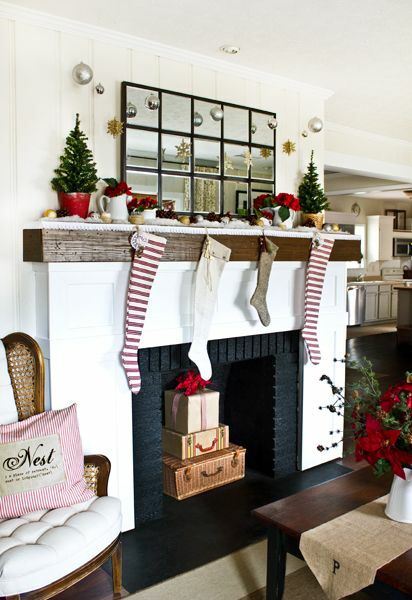 THIS is exactly what I’ve been envisioning for my (ugly) brick fireplace… and now you’ve shown me how to do it. (Rubbing my hands together and cackling gleefully!!) THANKS so much!! I like what you have done. But what also caught my eye was that you painted the paneling. I have the exact same paneling in my home. What did you do? Thank you SO much – I’m going to attempt this on my horrible grey brick fireplace this weekend! Thank you. I’ve just found your blog and you truly are in inspiration. Thank you so much for that. I hope someday I will be as half as good as you are. 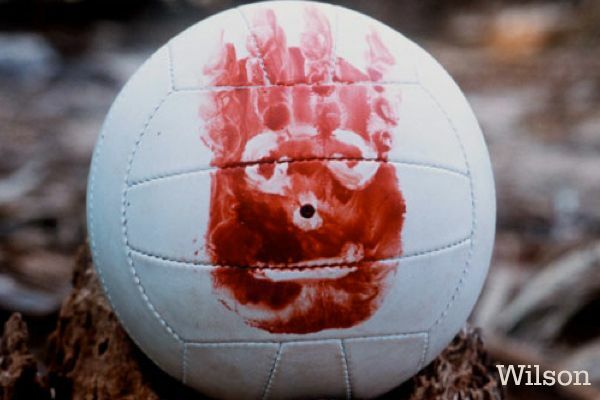 I just really couldn’t handle myself but laugh hard on the whole Wilson thing, that was genius. And more recently the scream one. This blog is truly unique, and so is your style. Thank you for sharing such incredible work and talent. Just found your blog via http://www.thepioneerwoman.com. You are so uniquely talented! I love the mantle and it has given me the inspiration to tackle my hideous fireplace 🙂 Your before and after photos are great, I love your style! Thanks for sharing. love the look of your fireplace!! I sneaked over from YHL’s shout out today. We have a beautiful ornamental fireplace that I painted a crisp white. In front of the actual opening is an ugly bronze door… I want to take it off & paint the inside as well, since we never use it… do you ever worry about drafts coming in from the outside? That is my main concern… that & if I want to ever have a gas insert put in, do you think the paint will be a bad choice? Thanks for your advice! Oh my stars it looks so gorgeous! Night and day transformation. Thanks for sharing!! This is gorgeous! What made you go with a dark mantle instead of a white one? This is Awesome, Awesome, Awesome. This is my first time visiting your blog but I too popped over thanks to the YHL shout out. All the motivation I needed to subscribe to RSS. My husband and I are looking for our first home and we have come across tons of fireplaces like these. I am officially motivated! Thanks so much for sharing. Hey there. Popped over from YHL (although do drop in on you guys occasionally anyway!) I was wondering if there is a link to the mirrored piece on the mantel in the winter picture. I would love to DIY something like that, but I’d like a closer look? Cheers Angela. Hi there! I saw this on Pinterest yesterday and commented that I was going to run home after work and do this (the painting the inside black) and I did!! I went by Home Depot, picked up black paint and came home to deal with a fireplace I havent had a fire in (minus candles) for over 3 yrs. The cleaning it out was GROSS!! 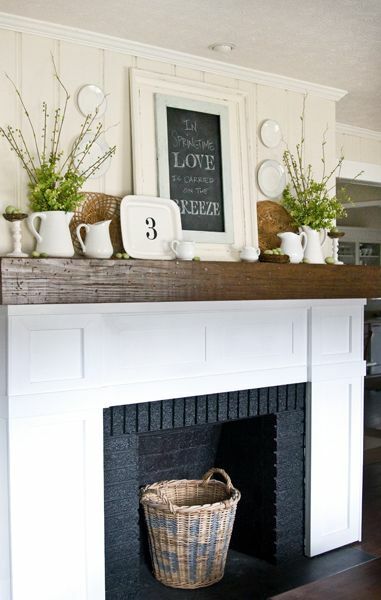 (ashes and cobwebs oh my) I applied the pain and WOOLAH – a crisp clean black fireplace gut! Im thinking of spraying the log holder silver and then a few peices of wood silver and white – I have so much cool mercury glass on the mantle that im afraid it might be overkill…..Ill post a pic when Im finally done! Thanks for the inspiration!! 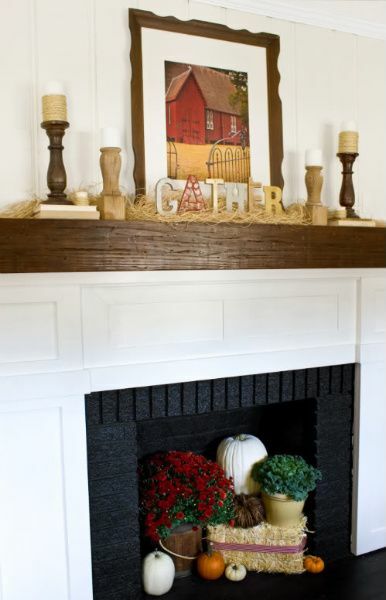 I really want to do this on my fireplace and I am wondering how wide the mantle is, and how you attached it to the fireplace. I have a flatfront fireplace and there is nothing to attach it to. How did you secure it to the front of the fireplace? I was also wondering how you attached the front mantle piece…nails? But I didn’t see visible nail holes. I’m looking to tackle this project in a few weekends…can’t wait! You are soooo talented – thank you for sharing with us all, on your MAGIC site! I am looking at my home with fresh eyes (at last I have hope for it’s daunting challenges, thanks to your unique creativity!) Sending you love and thanks, from South Africa!! I have a very difficult fireplace (and ugly)…the fireplace is set in and the bookshelves stick out…if you can imagine. We recently removed the previous homeowner’s mantle (it was awful) but don’t know what to put up…it looks nice without, but love putting things on mantles, esp for Christmas!! I would love to see your suggestion, and would love to send you a pic…we know we want to paint the shelves white, and the brick an accent color. 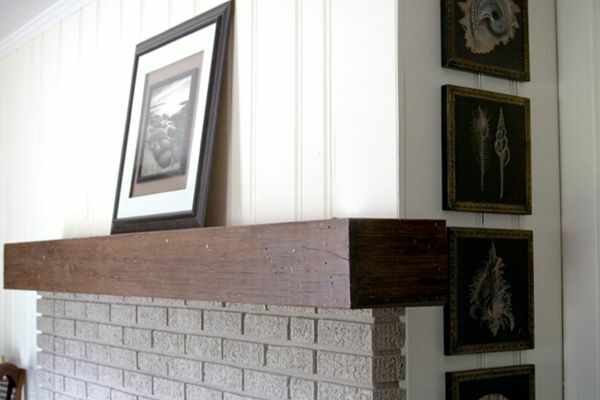 So the mantle, I guess would be white…But would the mantle stick past the shelves (they aren’t very deep) or sit flush? Would it be a shelf or thicker, like yours?? Any ideas would be WONDERFUL!! I love what y’all have down with your fireplace!! 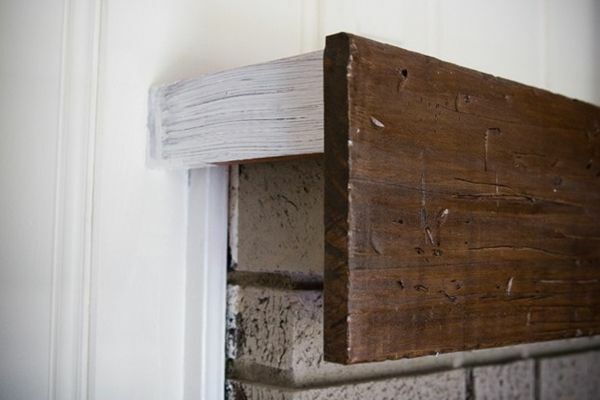 I have a corner brick fireplace from the ground up! I was wondering if I did something along the lines as to what you did with the bottom half, would it be weird to have brick on top where yours is the paneling? I love this. It’s probably my favorite post in the blogging world. When the renting days of my marriage are over, I hope to have a fireplace of my own to do this too. Thanks for your inspiration! One of the reasons, I’m trying my hand at blogging. Any suggestions on how to transform a fireplace with a hearth that is actually in the middle of a room? 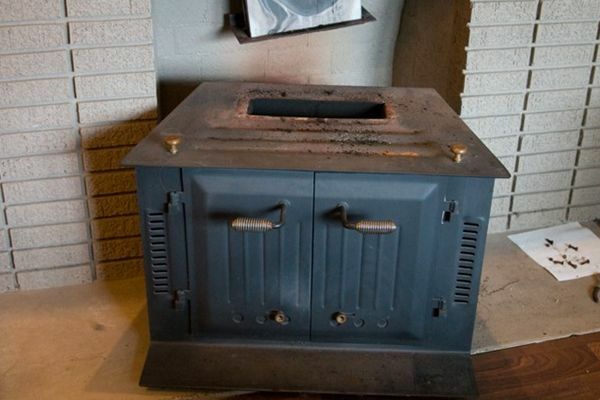 Exactly the same on both sides and, of course, it burns wood in the actual fire box. It is really the focal point of the whole two rooms, but when I say it’s ugly, believe me, it’s U-G-L-Y…..if I implemented the ideas you have here (which are awesome and in my budget) would you do both sides exactly the same again? 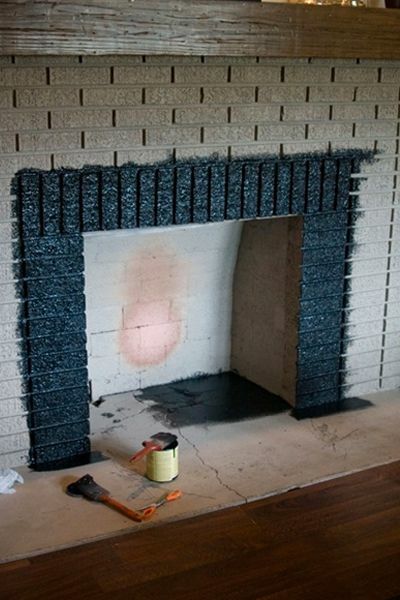 And would you paint the bricks on the hearth black as well? I can send you a picture if that would help….but just haven’t been sure what to do with it since we moved in….thanks….and I LOVE your blog!!! Thanks for sharing this post! It is simply amazing and beyond inspirational. I am so encouraged to realize I CAN DO this project. I love your fireplace, I have been looking on line for a solution for mine and got to your page. My fireplace is brick also but is 11 feet of brick (only the lower part of the wall). I have the TV on top. I guess I got crazy yesterday and removed the white mantel self. I am thinking that I could cover most of the brick with board and batten and I love the paneling on yours. Can I send you a picture please? I could use any advise you can give me. You should have seen my husband’s face when he came from work last night and sow the destruction. You are both so talented, thank you very much for the inspiration. 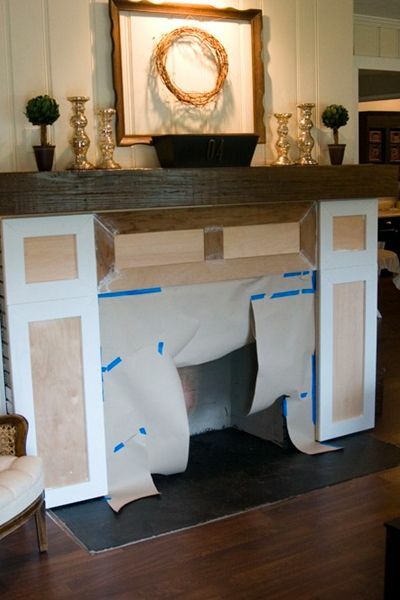 Inspiring post, and great fireplace make-over! I was just curious, did you add wood to the bottom of your wide mantle lumber to complete the appearance of a thicker mantle? In other words, if you look up at the underside of the mantle, is the front 1×8 board just an overhang, or did you box in the bottom? Hope that’s clear. It’s surprisingly hard to describe something like that! 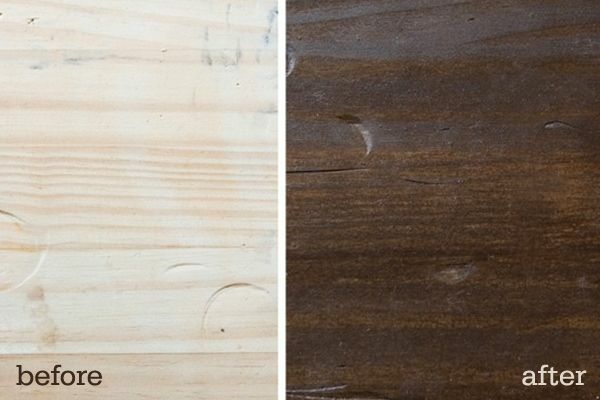 What stain did you use, and what type of wood? I tried a dark walnut, but it’s not as rich in color as your. I absolutely LOVE what you’ve done to your fireplace. I have one thats a full wall height and very wide red brick. I have been looking for very simple diy ideas to resurface it after my remodel. I am wondering if you have any helpful tips thats very similar to what you’ve done for mine. I would really appreciate some feedback! I have a picture for you but I have no idea how to link it. Also, I see above that someone asked the question how to attach the wood to the brick. I was wondering if you used any special type of screw or nail? I just can’t seem to imagine how it would go through the brick. Just wondering if anyone has tried this on a working fireplace. Is the wood okay near the heat? We have a pellet stove and our fireplace is painted brick, and we would love to try this, but the heat is my only safety concern. I am wondering the same thing. I have a gas fireplace and would love to do this but I am concerned that it will be a fire hazard. Charming and so inspiring! Love the styling for each season. I think I’ve found a blog to follow!! I love this transformation! For Christmas one of my presents was a gift card from Home Depot AND my hubby’s willingness to be the labor on the project of my choice…..I just handed him the iPad and this article and grinned! thanks AGAIN for the inspiration. This blog is my favorite! thank you for this, I have been looking at my fireplace for six years wanting to change it and after looking at what you have done, I know I can do it. and under budget. Thanks. What did you do about the duct work that the old firebox was attached to? Did you remove it all the way up the chimney, or just cap it somehow? I’m new to your blog and I am loving it! I have the UGLIEST fireplace ever…..picture your fireplace (before makeover) only the ugly dark red and black unpainted brick is from floor to ceiling (as in a twelve foot ceiling)! It takes up the entire wall!! I’m getting ready to repaint and do new decor. I’m wanting to go from primitive to a lighter cottage feel . Any suggestions on what to do with the elephant in the room? Because I have NO idea other than just paint it. Thanks!! it! Thanks for the inspiration! Thanks for the inspiration. My husband and I redid our ugly brick fireplace and pretty much followed your design exactly (although it took us longer than a weekend). 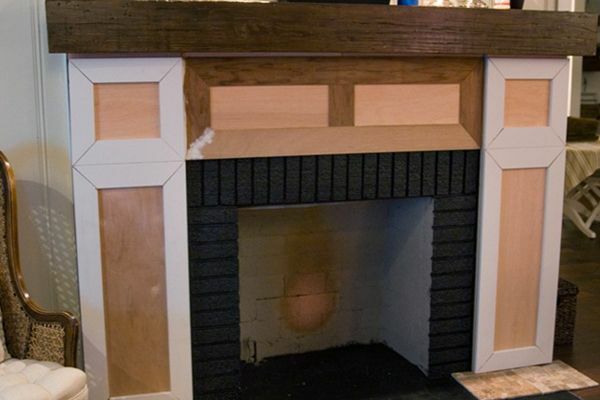 We had to make some minor modifications as we had a hearth – but the end result was amazing!! Thanks again! I just wanted to add one comment as a few people have asked about the Liquid Nails and if it is strong enough to hold the wood up. It is my understanding that it is strong enough, however when we did this our issue was the bricks were not level and therefore it was hard to adhere the wood to the surface with just this product, i.e., you press one corner of the wood on the brick and hold it and the other corner pops out slightly, so I would have had to stand there holding in several pieces of wood flat while the Liquid Nails dried. To address this issue, we ended up using both Liquid Nails and special screws that go into the mortar. The combo of the two together worked well. You are so talented! Love what you did! THIS IS ABSOLUTELY AMAZING!! You have inspired me to take on my 1970’s mantle! What did you do on the sides? Also it looks like you put an extra piece of trim all along the middle. Is that what you did or is that just the picture? Hi. We are going to try to attempt this. Will you please share… What brand and color stain did you use? Thanks. also, did you use treated wood? thanks. Oh my gosh, that’s so amazing I immediately showed my sister! It’s something anyone could do and for so little money. I’m pinning it for sure! I popped over to see this from At Home In The Northwest. It is a very creative solution to all of that brick. We have a fireplace like that too. 🙂 Luckily, ours has a nice mantle, and definitely looks better painted. I REALLY like yours though! That is impressive. Great job. Thanks for posting. Now I know what to do with my ugly fireplace. What at GREAT JOB!!! LOVE IT!!!!! You two are amazingly talented and from the great state of Alabama as well!! I am actually from Eufaula, but we are pastoring in Louisiana now!! Thanks again for inspiration!